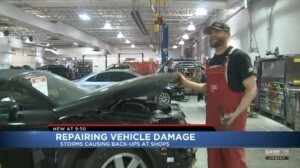 As we also saw back in January, the media has rediscovered that a lot of snow and ice on the roads causes cars to crash and therefore need collision repair. Allow filming: People are generally more nervous to be photographed or filmed — even though they’re not doing anything wrong — but you should allow the reporter to bring photographers and videographers inside despite your fear. These days, website posts need an image, and TV lives and dies by visuals. As we said, showing off your shop lets viewers and readers see it looks like a place they’d like to go. Typically, journalists are not going to be content with a posed image, so let them wander around and shoot the action as it happens; it will make for more visually interesting coverage. Let your staff talk too: Reporters are going to want to talk to a shop owner. But they might also want “color” — quotes and insight — from other employees, because good stories have multiple sources and most people have something interesting to say. Sadly, employees at many businesses are hesitant to talk for fear they’re going to say something wrong and get fired. Owners should let their people know it’s OK to talk to reporters in these kind of situations. And if you’re not that busy or you’ve felt volume is typical, there’s nothing wrong with saying that. Reporters are going to want to go where the story takes them and will be happy to have a contrast. Plus, that could be the best free ad if you’re the one in the news that can actually take new customers instead of having a waiting list. After the visit, there’s a few things to remember. Follow-up: Sometimes, a reporter will need to call you back for clarification on some point. (“When you said you fixed 200 cars, did you mean just cars or cars, trucks, SUVs, etc. ?”) Try and be available. It can be annoying, but it really helps them and the story. Scheduling: As we saw with “Anderson Cooper 360,” a story won’t always appear when you think it will — or even the reporter thinks it will — so don’t get upset if that happens. Sometimes, a story must be shuffled around to accommodate breaking news or some other editorial demand. And sometimes, they’re just not viable anymore and just must be killed. (Would you want to read a winter weather story that was held until April?) The good news is that at least in print journalism, an article that doesn’t make the newspaper will usually still be posted online. Be understanding: Sometimes, parts of a story are cut for space or because they repeat something else in the article. This can be very frustrating if you spent time with a reporter and never appeared. But take comfort in the fact that a) reporters hate when their stories get cut, too; b) the story is still a good thing for the industry, and if cutting your contribution made it better, then you took one for the team; and c) you’ve established yourself in the reporter’s mind as someone they can come back to for future assistance. Once you’re in a reporter’s Rolodex, they’ll be more likely to use you than call around hoping to find a source. A different development this winter is the renewed media interest in the battle between collision repairers and insurers on alleged “steering” and non-OEM parts. This is probably partially fueled by an “Anderson Cooper 360” piece and a slew of lawsuits on the subject which provide both an inspiration and a timely angle. Recent examples can be found here and here. Suggest it: Besides just calling in or emailing a news tip, it can’t hurt to raise the issue if they’re at your shop covering the winter angle. Mentioning the “Anderson Cooper” piece should give them something tangible to Google for a little background. Leave it at that, though. Few things are more irritating to a reporter than a tipster calling repeatedly about an unrelated story — even one with merit — while they’re busy running down five other articles on a beat and responding to breaking news. Be precise: Recycled, aftermarket, OEM — terms you could potentially be throwing around might be confusing to a reporter and their audience. Give definitions. I guarantee your average person thinks “aftermarket” means “used.” Also clarify what you’re talking about; not everybody is familiar with the industry or even basic auto part terminology. For example, here’s one story that refers to aftermarket air bags, when in fact the repairer was probably talking about the associated air bag system. The reporter probably wasn’t aware that there aren’t any legitimate aftermarket air bags. Follow-up: An issue this contentious could require a follow-up call by the reporter for a variety of reasons. Be available — particularly if they’re calling to get your side on what the other party said about you in the dispute. Have examples: You saying you’ve seen a problem probably won’t be enough for the visual TV medium, and likely not for print newspapers as well. Providing the context discussed above or actual examples of the issue will be vital (see this video for an example). And there’s nothing wrong with sending a reporter down the street to a colleague you’ve heard complaining about the topic who has a better tale than you do. You might not get your 15 minutes of fame, but you could be helping the industry as a whole.